The presence of trees plays a significant role in our urban environment. Integrating trees into the urban fabric properly can help support a healthy community by adding positive social, economic, and environmental values to the city. This week, our Project Manager Josh discussed the importance of urban forestry, and shared his experience of volunteering with the city of Seattle’s task force to protect urban forests in Seattle. Trees for Seattle is the urban forestry task force for the City of Seattle. | Image via Trees for Seattle. I worked briefly in the planning department of the City of Normandy Park in 2015. One of the common concerns that we would hear from citizens related to tree removal- half of the residents wanted to remove trees on their property to improve their views of the shoreline or expand their homes, while the other half wanted desperately to save all trees for ecological purposes. TFS advocates for increasing the urban canopy cover across the city while nurturing and supporting existing trees and green spaces. Canopy cover is defined as the “percentage of the city that is covered by trees, as seen in an aerial view.” There are obvious advantages of trees- they are pleasant to look at and increase property values. Trees also provide natural stormwater management through the reduction of runoff of paved surfaces; reduce the urban heat island effect, which diminishes the need for HVAC in the height of summer and winter; and mitigate air pollution near congested streets. Additional reports provided on the TFS website only date back to 2007, but they state that at that time, the city had around 22.9% tree canopy coverage. The Eastlake neighborhood, for which Urbal’s office is located, included less than 15% overall canopy coverage. I would suspect this number has not improved much since then, considering the incredible growth in development experienced along Eastlake Avenue. So how can the average citizen get involved with Seattle’s urban forestry efforts? TFS also organizes volunteer work parties to promote stewardship in neighborhoods across the city for the natural environment. More than 100 work parties have been conducted at sites city-wide, engaging over 150 volunteers, including one in the Wallingford neighborhood that I volunteered at this past weekend (as well as once last year). The work at this particular site- the landscaped triangle at North 46th Street and Aurora Avenue North- began in 2014 with the removal of invasive species that were not only harming existing mature streets, but causing sightline issues for pedestrians near a busy arterial. TFS removed English Ivy (growing into tree canopies), Black Locust Seedlings, and various grasses. On Martin Luther King Jr. Day in 2015, the group once again weeded invasive species, but also placed 250 new plants in the area. They chose White Rock Rose shrubs for the triangle due to its high drought tolerance, low growth traits, and low maintenance needs. Ironically, White Rock Rose is not a native Pacific Northwest species, but there are no concerns that this plant is going to overtake native plants. Volunteers helped clean up the site after removing invasive weeds in the Wallingford neighborhood of Seattle. 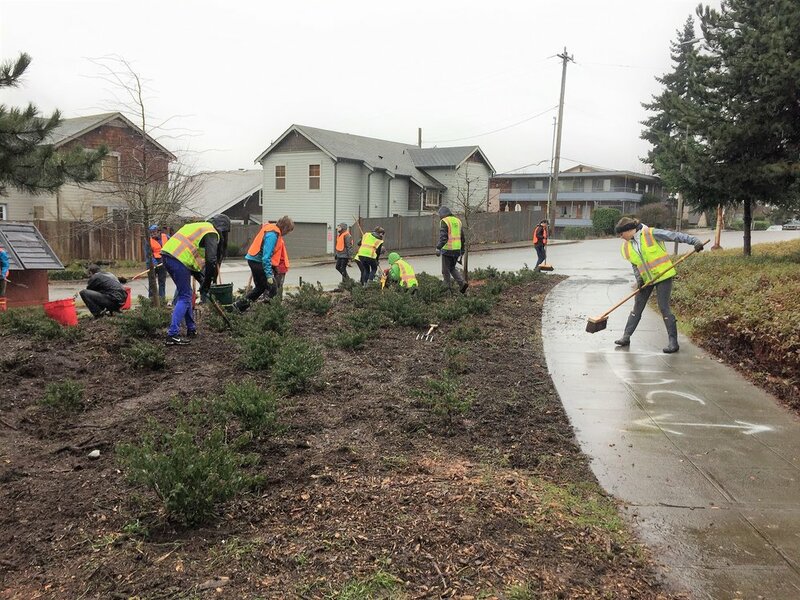 | Image of Wallingford Work Party via Trees for Seattle. I would encourage those that are interested in either urban forestry or just volunteering more to take a look at TFS’s website for upcoming volunteer work parties. The organizers bring food and coffee for volunteers as well as all the necessary tools and gloves for the work. The work can be backbreaking, but it’s a rewarding experience as you witness the growth over time of new trees and shrubs in your neighborhood. “Watershed Forestry Resource Guide.” Center for Watershed Protection and US Forest Service. Last visited: 08 Feb 2016. Available WWW: http://forestsforwatersheds.org/urban-tree-canopy.